Few things derail your editing schemes like children. Clothes often need to be changed multiple times a day. They grow out of those same clothes every few months. Most of their toys have a six month half-life. Then there are innumerable accessories from cribs to strollers to baby bathtubs that thwart the most earnest minimalist aspirations. Given all of this, if you’re a parent and there are products that reduce the amount of stuff your child requires, you should probably get them. 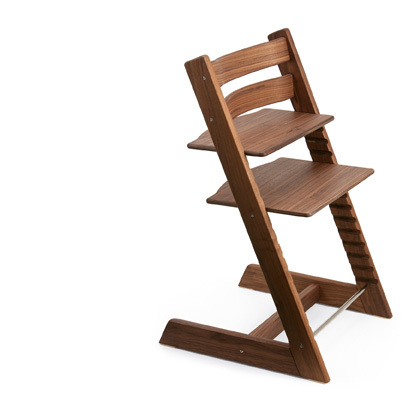 The Stokke Tripp Trapp high chair is such an item. Its simple, classic design allows it to be useful from infancy to adulthood. The inverted seven shaped base has slots that accommodate either a seat or footrests. As your child grows, you lower the seat and footrests in the slots to the appropriate height. You can even remove the footrest and use it as an adult height chair, making this a great piece of furniture for people like grandparents who frequently have children visitors, but for whom a dedicated high chair takes up too much space. The seats start around $200 and go up depending on the material. Oak and walnut version are available that are quite a bit more expensive; these options are worth considering as this could easily be an item kept for many years. Do you have other tips for minimizing kid clutter? Let us know in our comments section. Best advice for kid clutter is to limit what toys they get (3 different types). Focus on building a collection: Legos, Erector Set, Hot Wheels. Then have people who want to buy for them items that add to this, donate all others. They do not need one of each toy on the market no matter what Grandma says. $ in a 529 Plan is a better investment. I got one of those for my son. He hated it and it’s now in the attic. the additional baby set on ebay for another 20€. We use it daily since our son could sit and I’m sure we will use for many years to come!